We wanted to share a few of the gorgeous photos taken by studioatticus for a wedding we both did in late August. Apryl and I didn’t take many photos of the bridal bouquet at the studio so we were especially happy to see the wonderful ones taken by Connie Miller at studioatticus! I just love this photo, so much happiness in it! And a wonderful photo of the gorgeous bride and groom! Apryl and I loved this photo of the bride pinning a corsage on her Maid of Honor, the colors in Indian weddings are so absolutely gorgeous and I love how you can see the mehendi too! The table design for the space was elegant and simple. With such gorgeous, saturated colors throughout the space, we worked with our bride on a table design that wasn’t too busy but incorporated beautiful elegant flowers like “water lily” style dahlias, peach calla lilies, orange ‘Mokara’ orchids, and magenta roses. 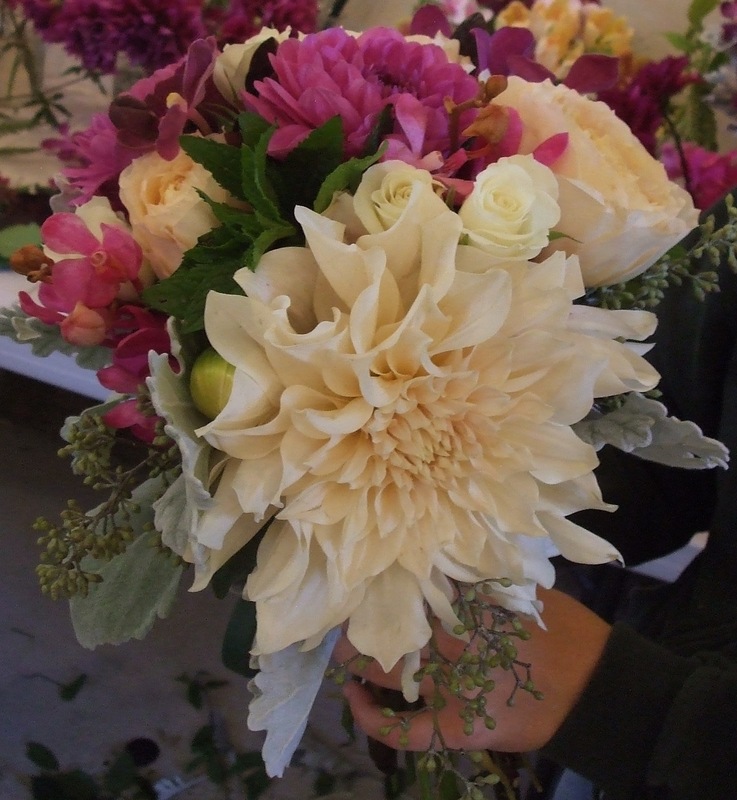 Apryl and I just finished up personal flowers for a lovely bride this past weekend. She really wanted a wild, slightly natural look to fit with her informal nature and love of the outdoors. Rifting on our post from the other week about autumn weddings using less traditional ‘fall’ colors, this wedding had a palette that hinted toward the fall with chocolate cosmos and orange ilex berries but stayed light and airy feeling with gorgeous peach, ivory, and chartreuse cymbidium orchids. A bouquet that’s light to hold: This is something a lot of brides might not think of, but it’s really nice when you have a light bouquet, your hands and arms don’t get tired! 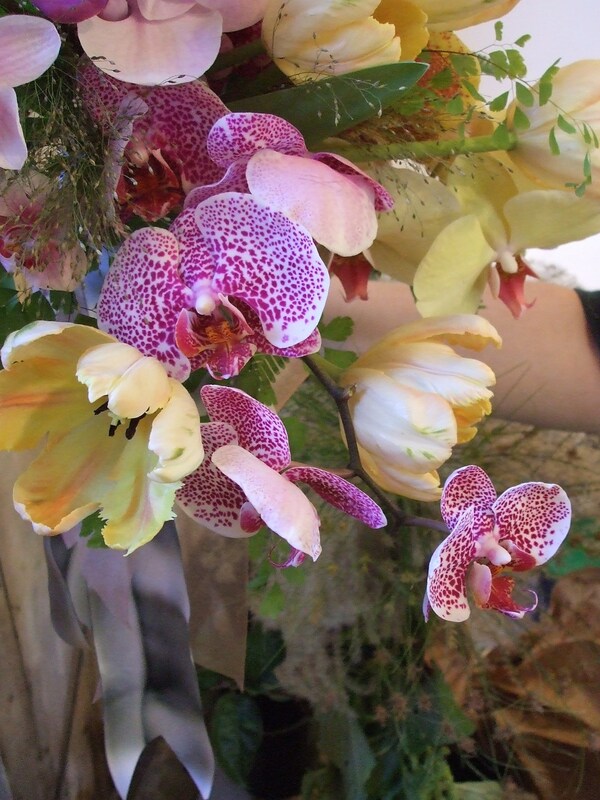 Bouquets that have a lot of orchids are often very light because each flower is individually wired. Although this often increases the price because of the delicate and time consuming nature of wiring each flower, the results are worth it when you want something a little exotic and delicate looking that is a breeze to hold. Carrying out the color theme: In the bridesmaid bouquets we carried the elegant slightly autumnal aesthetic with a bit more orange with the inclusion of orange mokara orchids and orange ilex berries. 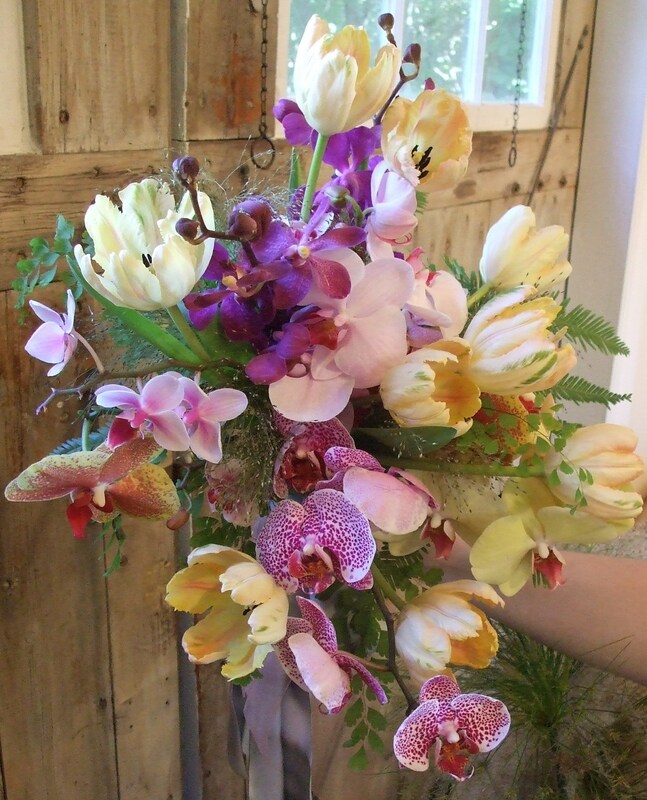 We also found some incredible light burgundy cymbidium orchids that fit the design perfectly. 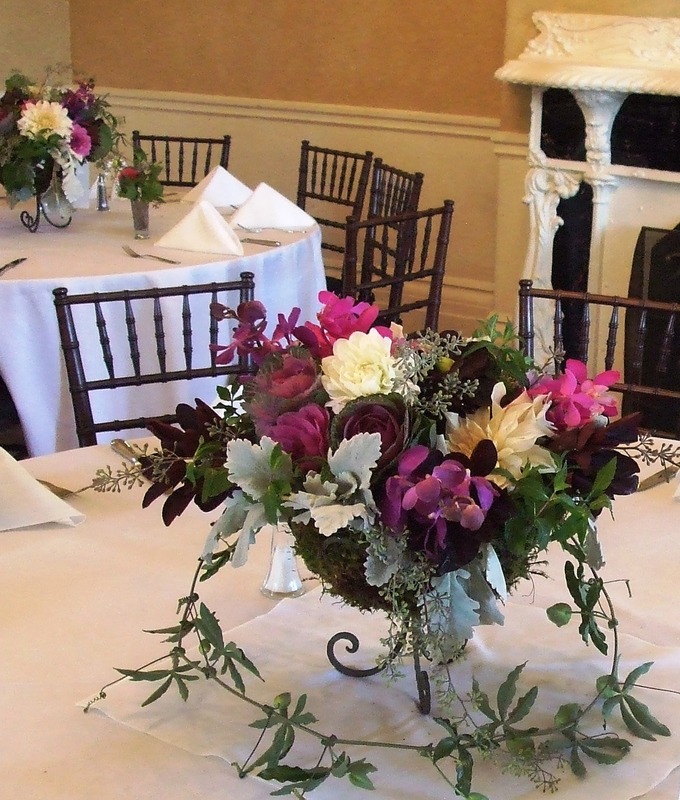 All photos and floral design by Petalena. Apryl and I just finished up most of the renovation of our studio just north of the city, it is so cute and we are very happy floral designers when we are in there! We still need to put some art on the wall, hang curtains, etc. but it looks great and has really beautiful light. The window ledge seen below seems to be becoming our little ‘flowers that didn’t make the cut’ drop spot. 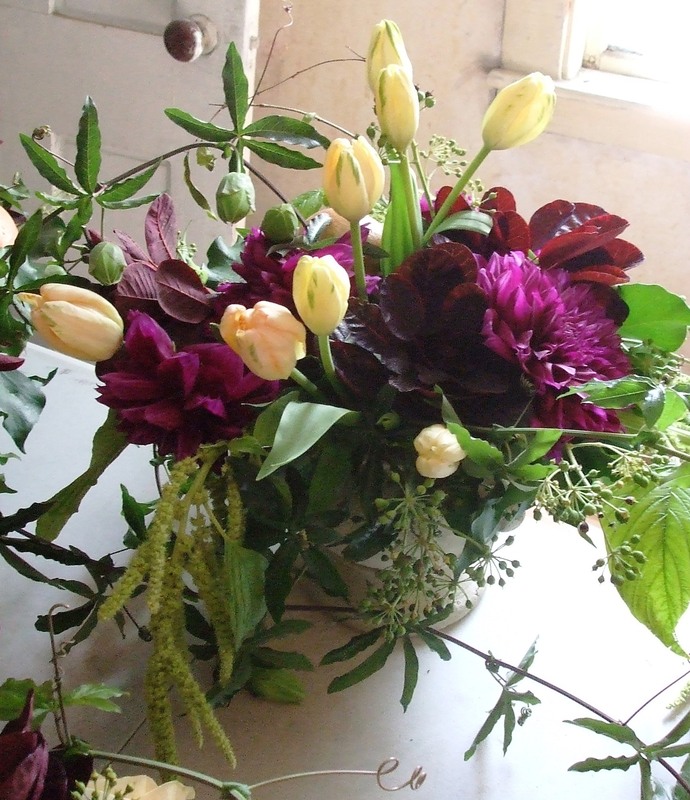 It’s fun, the arrangement is different every time as flowers get dropped in that have flaws that make them not usable. But because we love flowers, we can’t just toss them, so they live happily here on the window sill! We have a huge shelf for storing our vases, it’s a varied collection of things we buy for specific events or ones we find that we just have to have because we know we’ll use them in something eventually! 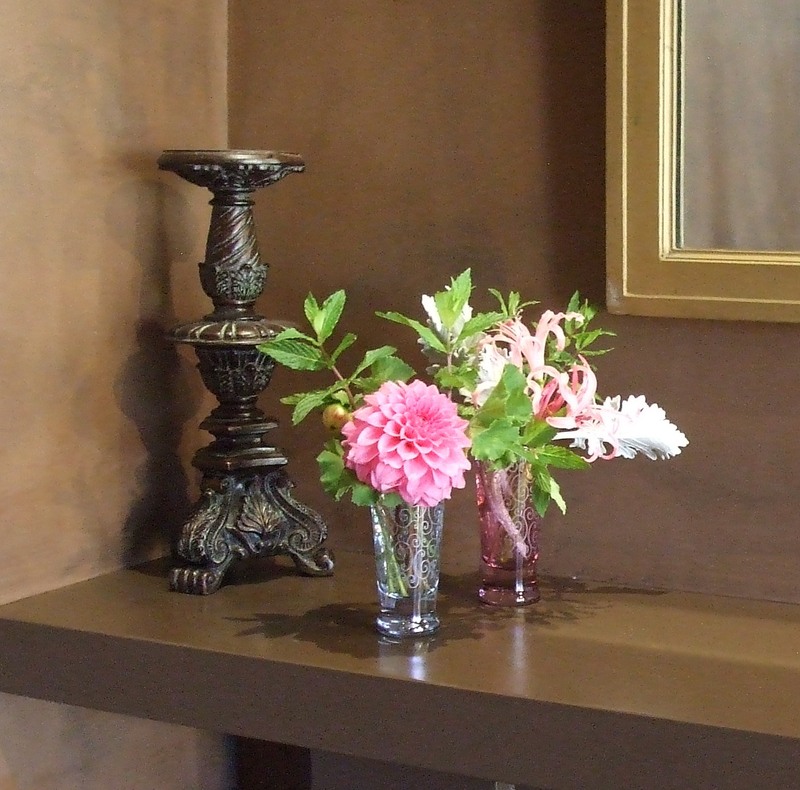 Our Collection of Vases, always expanding and contracting! 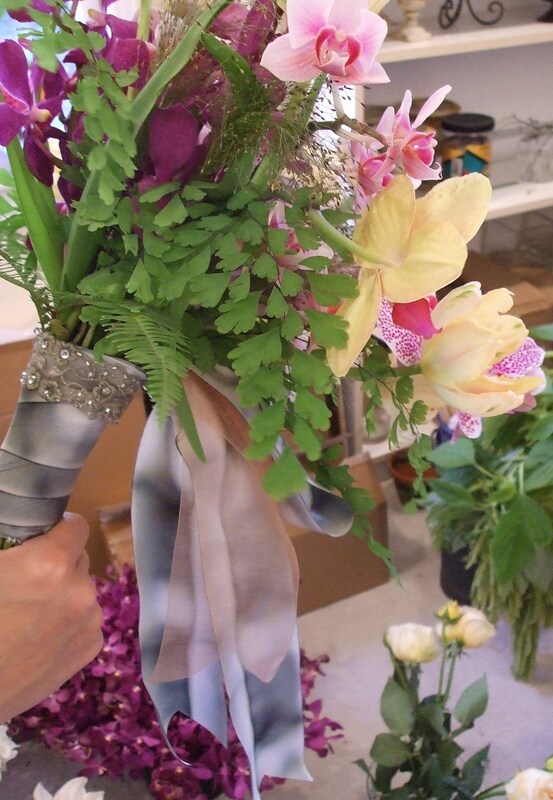 Here is Apryl at one end of the studio working on a corsage with our big cooler at left. We’re putting in a nice antique drawer where she is standing next week to hold all our fabrics and ribbons. This is our workstation area for now at least, in the next month or so we’ll put in taller counters with storage below, but this works great till then! Happy designers in their studio! Apryl and I have been exploring the different vines available at the flower market to incorporate into our designs. Vines are so great to work with, they are like visual cues, leading the eye around a design, creating shape and movement. For the weddings we did this past weekend we were able to get passion flower vine, an incredible plant with wonderful little leaves, curlicue little roots that shoot out so the vine can latch onto things, and incredible flowers. The ones we purchased at the market weren’t open, which was actually kind of nice because it ended up being a neutral green we could use in a lot of things. Although I admit I find all flowers intriguing, this one is particularly so. It is named “passion” flower not because of love, but after the passion of Christ. Back in the 15th and 16th centuries when Spanish missionaries first discovered the plant, they interpreted aspects of the flower’s unique structure as symbolic of the crucifixion of Christ. The radial ‘filaments’ that surround the flower’s center were interpreted as the crown of thorns, the ten petals and sepals interpreted as symbolizing the ten apostles, the top three stigmata symbolic of the three nails and the five anthers, the five wounds. In Europe, this plant has been given common names connected to this interpretation for several hundred years. The plant also has long history of traditional medicinal use in North America where Native Americans gathered the fresh or dried leaves of the plant to make in a tea infusion used to treat insomnia and hysteria. Pretty amazing plant, huh? This wedding was a small elegant family event held last weekend – and the bride is a leader and visionary in the arts in Boston – so we really wanted to something unbelievably special for her! Going to the flower market to buy flowers for her wedding, vendors saw the incredible things we had pulled for her, and one even said, ‘these are flowers for star!’ We agreed because they were completely right! About the Design – We wanted to give this bride something unique, slightly ‘sculptural,’ and mesmerizing. She loves orchids and unique floral materials and really gave us carte blanche to run with her adjectives of ‘unruly,’ ‘feathery,’ and ‘billowing.’ It’s so fantastic when you have a client like this who sort of gives themselves over to the experience, Apryl and I can run with it and do something really special. I adore close ups of gorgeous flowers, so one more time! 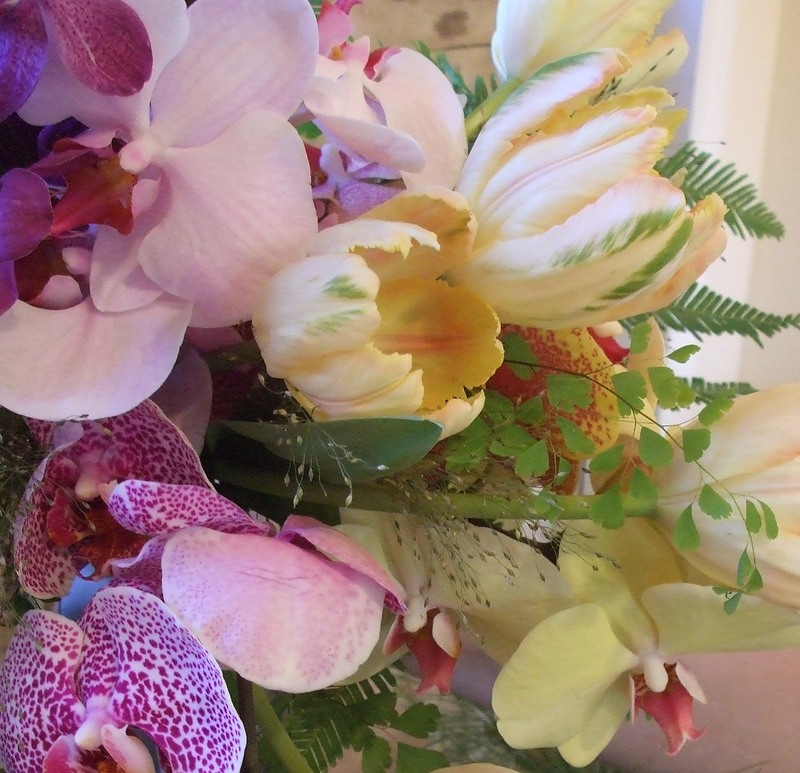 About the Flowers – We used stems of funky ‘speckled’ white and magenta phalenopsis orchids, pale yellow, and iridescent pink/lavender phalenopsis orchids, peach and green parrot tulips, mini papyrus stems, and maidenhair ferns. Because this bride also loves unique fabrics and textures, we added some unique elements to the handle of her bouquet – a midori silk ribbon I call ‘storm’ and an embroidered ribbon with Swarovski crystal. 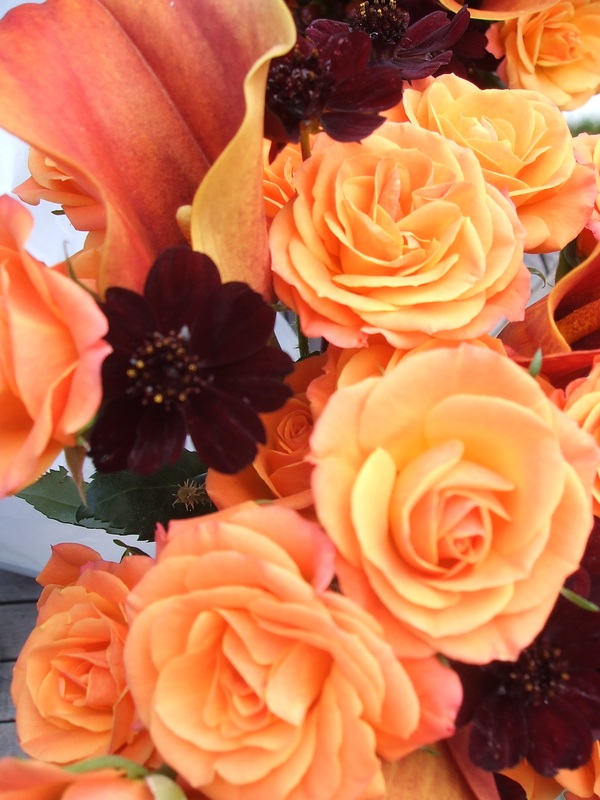 Who says getting married in the fall you need to chose gold, reds, and oranges for your colors? Explore the color palette of the wedding we just finished yesterday that had a gorgeous color palette of magentas, purples, greens and silvers. 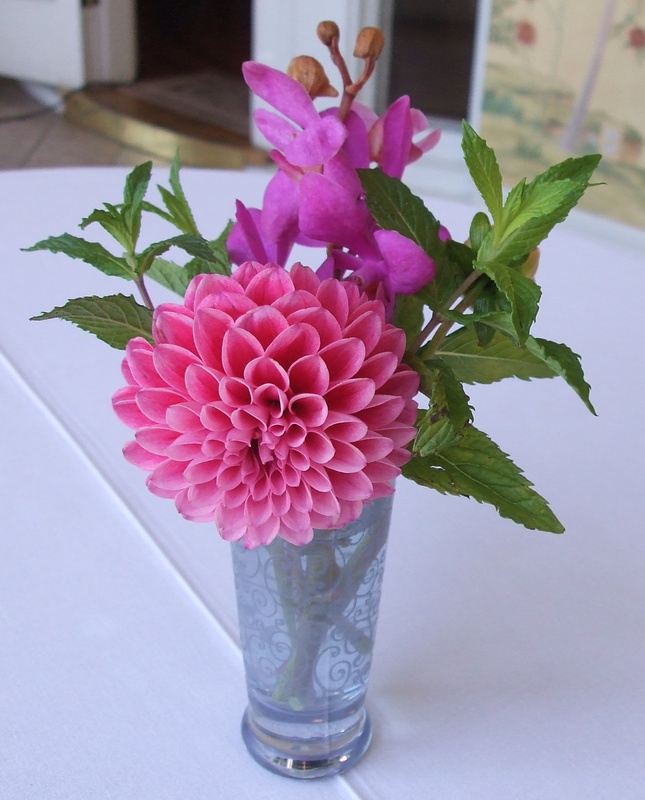 The couple also wanted to incorporate ‘green’ aspects wherever possible so we focused our flower choices on those that could mostly be found locally – dahlias, mint, dusty miller, and lavender all came from local growers. 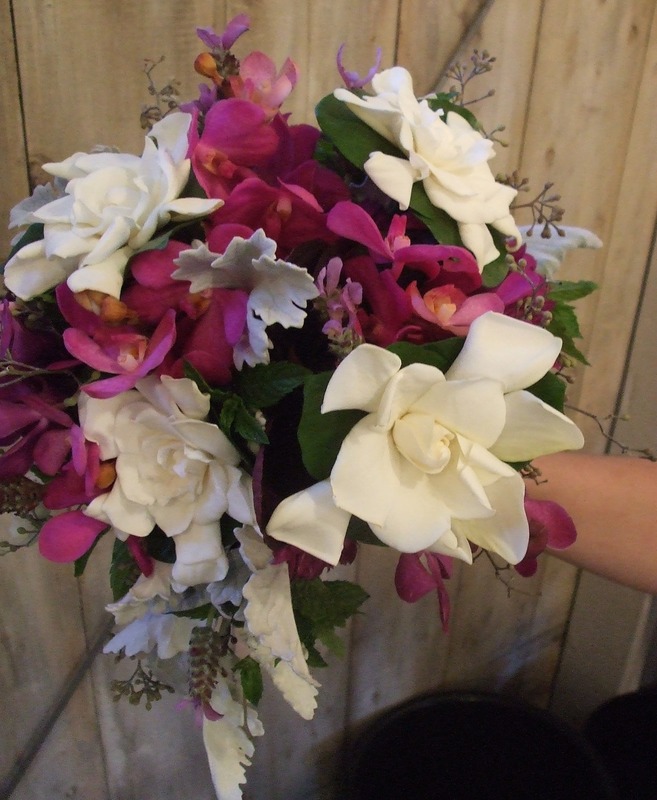 We love this bouquet, primarily comprised of deep purples, bright magentas, silvers, and greens – then accented with one of the most fragrant, special, and highly prized flowers – gardenias. 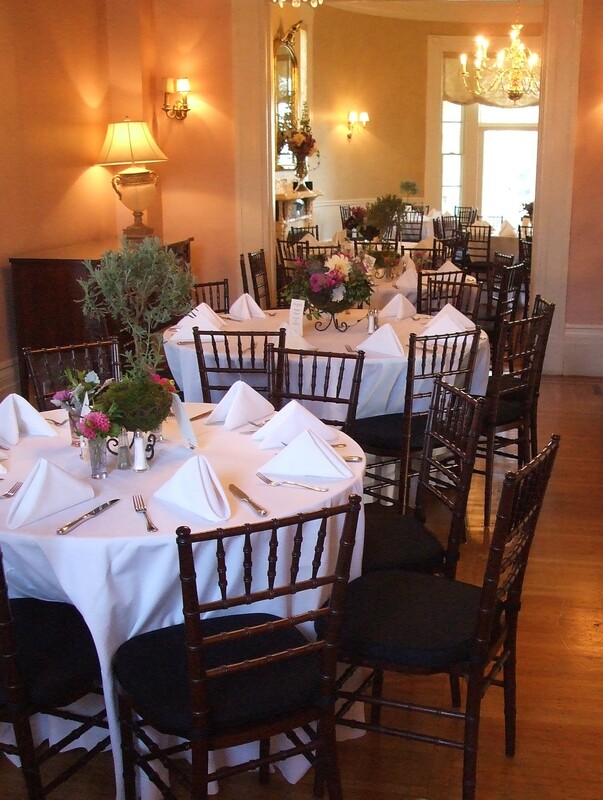 The venue was unbelievably elegant – the Commandant’s House in the Charlestown Naval Shipyard. With its gorgeous rooms, tall ceilings, fireplaces and chandeliers, we went for a mix of two styles of table arrangements, Apryl and I love to do this, it gives a room a varied and subtle appearance. 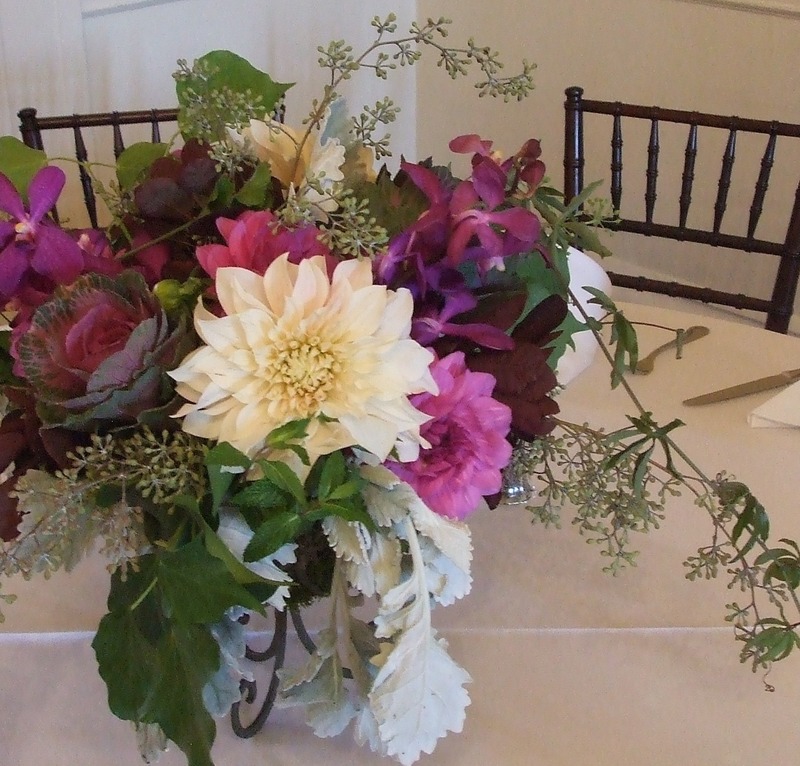 One design used pedestal iron containers filled with moss and “Cafe au Lait” Dahlias, magenta and purple dahlias, ornamental cabbage, purple smokebush, “Mokara” orchids in magenta and purple, mint, lavender, and dusty miller. We also found the most incredible passion flower vine that we intertwined on each piece. 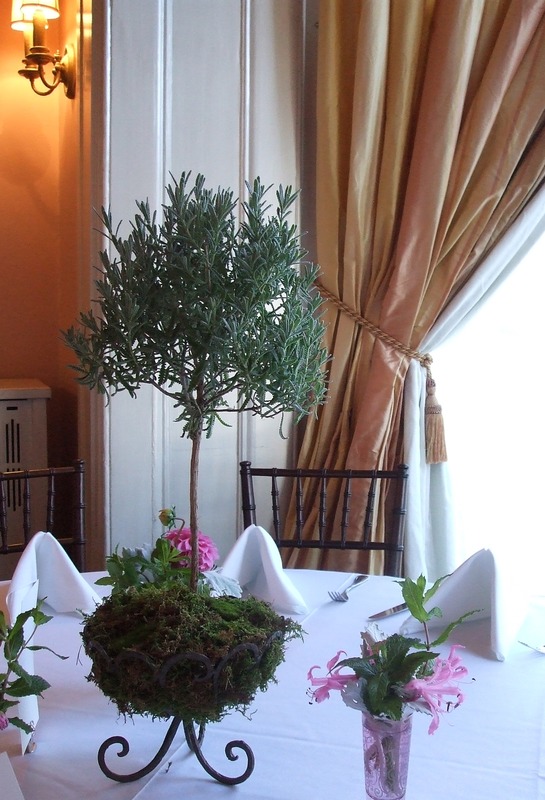 The other table design involved potted lavender topiaries potted in pedestal containers filled with moss and surrounded by bud vases filled with dahlias, nerine lilies, and mint. These added a charming, slightly whimsical touch to the overall design. 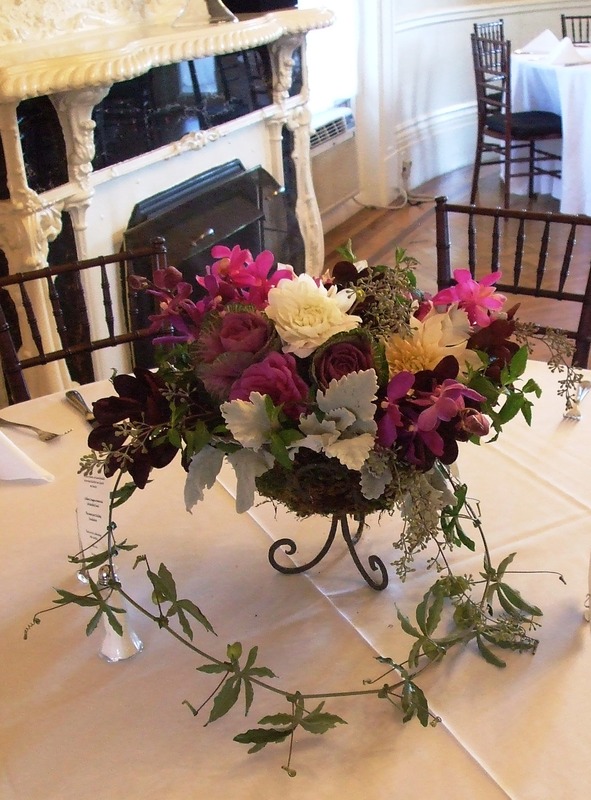 We worked with many of the same flowers in the bride’s bouquet and table arrangements for the rest of the wedding party. 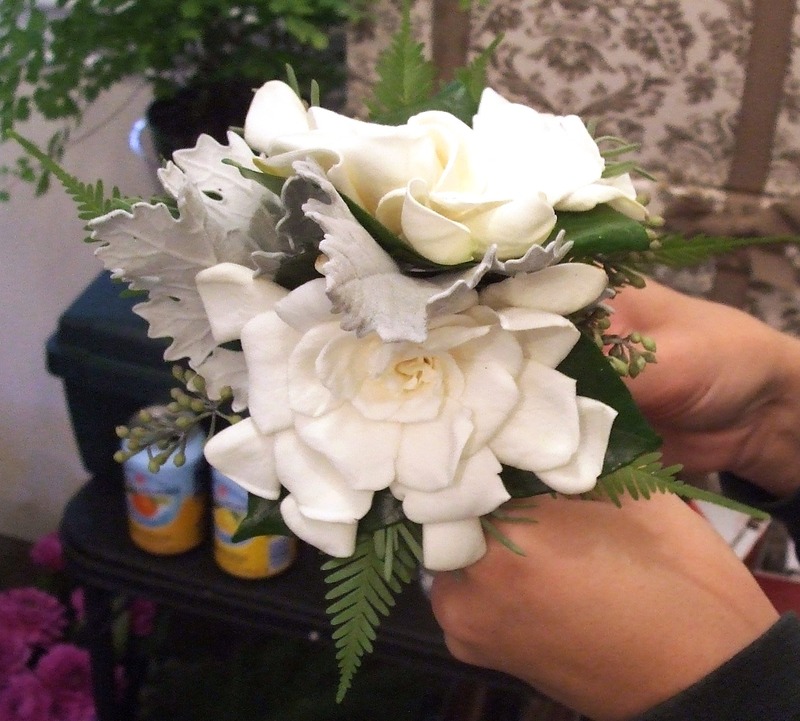 The Maid of Honor’s bouquet is below along with the darling gardenia handheld corsage for the bride’s mother. I took WAY too many photos yesterday and had a hard time deciding which ones to include, so we’ll end with a few more from the reception at the Commandant’s House. 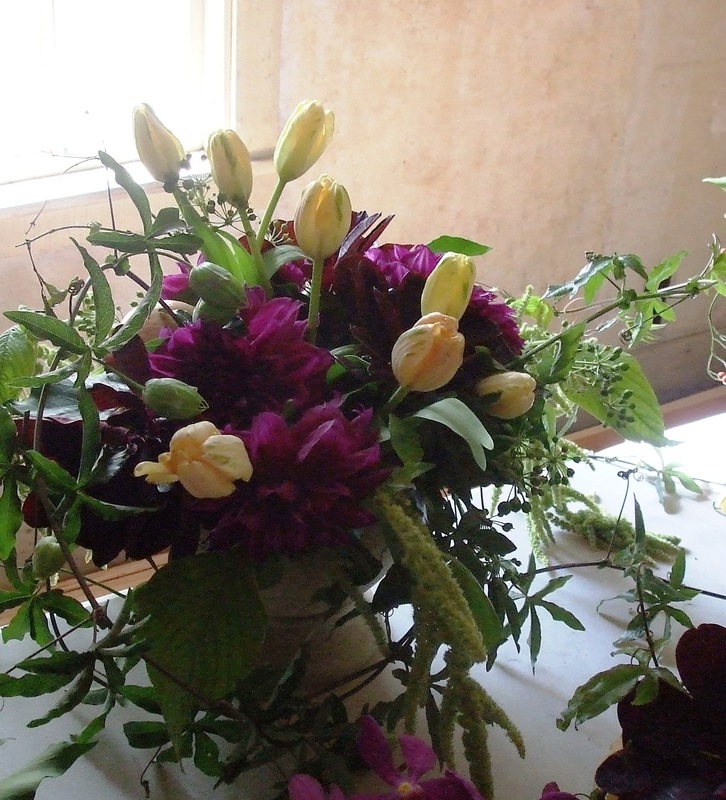 Comos in general are wonderful flower for arrangements, coming in a variety of colors from ivory, to pale pink, to a deeper magenta, and a dark almost burgundy in the summer months. I love them because they remind me of my grandmother who grew them in her Maine garden every summer. They are a Victorian kind of flower, old-fashioned and lovely. 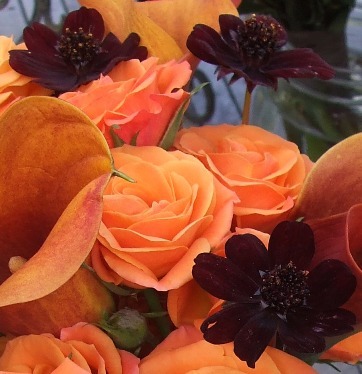 The chocolate cosmos are only available in fall which make them something to savor.